Hola mis Reynas! Since we’ve been talking about traditions this month I’d like to continue the conversation because ya viene la hora de las posadas! In true Mexican tradition, this beautiful celebration takes place on each of the nine nights leading up to Christmas. Such a special time to make memories with our families and express gratitude! And you know as Mexicans, we do our fiestas right! I remember as a kid we used to walk around the neighborhood during this special time, sing hymns, share meals and occasionally even break piñatas! It’s a beautiful tradition and one that makes me so happy to be Mexican! Bueno, I’m getting ahead of myself. One of the things about Mexican traditions that we all have in common is the importance we place on food, verdad? Food is at the center of traditions in our homes! We have our favorite foods for holidays, weddings, funerals, even for hangovers! The question my family always asks is “y que vamos a comer?” And with that, usually comes the king of all Mexican foods, reynas I’m talking about Menudo. You can’t have a celebration without the king! Growing up I knew when there was a special celebration, we were guaranteed to have menudo! I could smell it a block away from our house! N’ombre! Que rico! Pero, Reynas…in the times live in now, sometimes it’s hard to take the several hours needed to make menudo from scratch, no? We’re all so busy working, running around picking up Sarita from band practice and Georgito from soccer practice and taking care of our families! And then when the holidays come, you’re running around even more from house to house trying to juggle, so many things that some days you might feel our food traditions are too big a chore! We really want to keep our honored traditions and our homemade flavors but simply don’t have the time! Well, Reynas, I hear you…loud and clear and we take the business of preserving the menudo tradition so seriously that we’ve developed a new helper called Menudo Starter for you to try in your kitchen! Miren, time isn’t going to slow down but with this Menudo Starter, we’ve taken out the extra work of cooking the bone broth and cleaning the meat, so you can get to what’s important: spending time with your family. With our Menudo Starter, you can have your abuela’s family recipe for menudo with a little help and in less than an hour! No lo puedes creer, verdad? But it’s true! It’s a great way to give your family the same homemade taste you grew up with and love but with your own sazón. How great is that? Honor your favorite family recipe or try something new and in one hour, you can be sitting with your family enjoying homemade menudo, the conversation and the laughter instead of working away in the kitchen. Trust me on this one…you’re gonna love it! 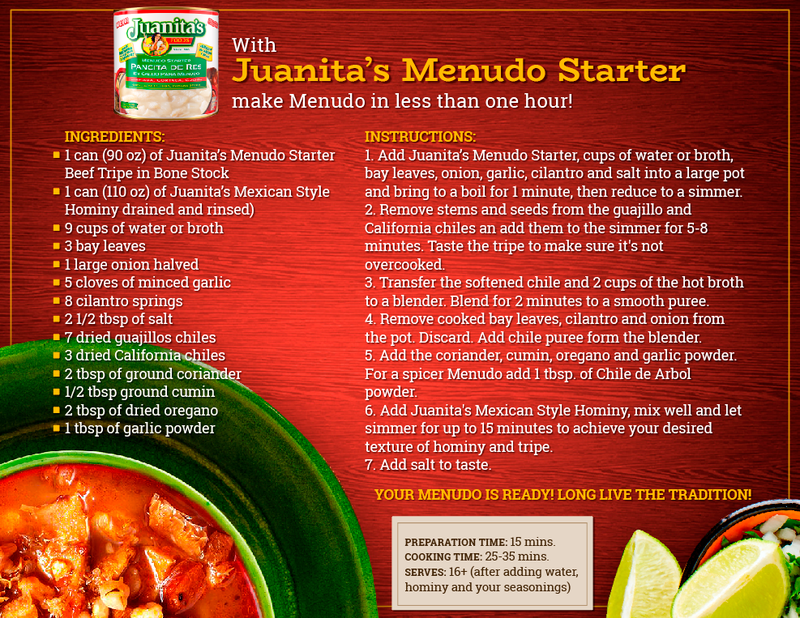 Bueno, to get you excited to try our Menudo Starter, I’ve included my recipe below! Preparation time: 15 mins. Cooking time: 25-35 minutes. Serves: 16+ (after adding water, hominy, and your seasonings). Add Juanita’s Menudo Starter, cups of water or broth, bay leaves, onion, garlic, cilantro, and salt into a large pot and bring to a boil for 1 minute, then reduce to a simmer. Remove stems and seeds from the guajillo and California chiles an add them to the simmer for 5-8 minutes. Taste the tripe to make sure it’s not overcooked. Transfer the softened chile and 2 cups of the hot broth to a blender. Blend for 2 minutes to a smooth puree. Remove cooked bay leaves, cilantro, and onion from the pot. Discard. Add chile puree form the blender. Add the coriander, cumin, oregano, and garlic powder. For a spicer Menudo, add 1 tbsp. of Chile de Arbol powder. Your Menudo is ready! Long live the tradition!